Give your buddy a shot of B12 with the new Orbee-Tuff® Strawberry by Planet Dog. 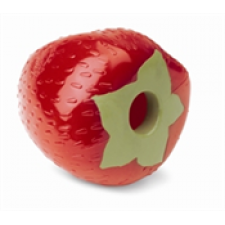 This toy delivers 100% of a dog’s daily requirement of rompoflavin, chompohydrates, vitamin WAG and dietary fun. Insert your dog's favorite treat or a dab of peanute butter and watch them go crazy! This toy is designed for fairly agressive dog chewers.